“On our team, the best players play. Watching Erik Karlsson in these playoffs is painful. Not painful like a lacerated Achilles tendon. More cringe-worthy, with a little hint of embarrassment. It’s like watching Michael Jordan on the Washington Wizards. Or Jaromir Jagr trudging up the ice as his Bruins teammates wait for him at the far blueline. They never demand the puck, but simply pay homage to a legend who once flew through the neutral zone. You know the player is — was — capable of more. You’ve seen it with your own eyes. Now it’s simply a memory. That’s how it feels watching Erik Karlsson in these playoffs. It’s probably unfair to say that about a 22-year-old who returned to the ice just ten weeks after a devastating injury. Karlsson should be able to recover physically after a full summer of rest and proper rehab. But where will he be mentally? Karlsson has been a total disaster in the second round series against Pittsburgh. He wasn’t much better in the prior round against Montreal. You can sense that he knows he’s capable of more, but his body just won’t let him. Crosby scored on the powerplay early in the second to complete his hat trick as a result of Karlsson’s hooking penalty. 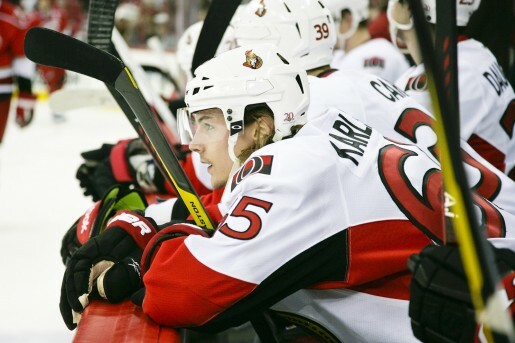 Ottawa coach Paul MacLean had seen enough and Karlsson played only sparingly the rest of the game. 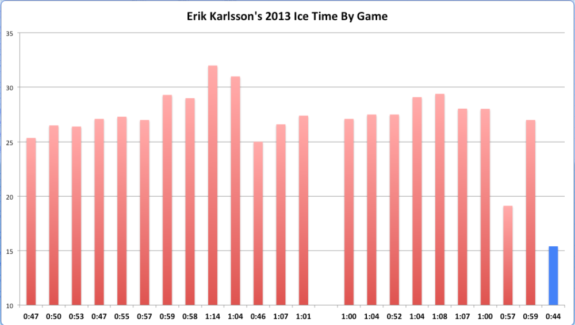 Karlsson’s ice time in Game 3 was well below his season average this year. Even after the injury (gap in the graph above), he’s been routinely in the 27-29 minute range, with the exception of Game 5 against Montreal, which was a 6-1 blowout. The most noticeable issue in the playoffs has been Karlsson’s shift length (noted underneath each bar in the graph). Prior to Game 2, Karlsson led all players in average shift length during the playoffs. While some of these extended shifts are on the powerplay, the Penguins have been making sure that he has to play ‘tough minutes’. In addition to being physical with Karlsson, Niskanen says the Penguins are focused on being in the right position when he’s on the ice. Karlsson’s frustration has led to indecision and he’s gone from all-important asset to outright liability. MacLean’s biggest challenge is finding a matchup that Karlsson can handle. Evgeni Malkin is too physically strong and Crosby is too fast. With Pittsburgh on home ice and able to make the last line change, Karlsson couldn’t hide. The Penguins attacked Karlsson with Crosby’s line whenever possible in the first two games. They tried to force Karlsson to play defense and wear himself out working to get the puck back. MacLean hopes that will change when the series shifts to Ottawa for Game 3 on Sunday night. MacLean has said he’s more concerned about having the right defensive pairs on the ice against certain matchups, but he’ll still be handcuffed with limited options if Karlsson can’t regain his confidence. How can MacLean tell which defensive pair to deploy when he doesn’t have the benefit of a stoppage in play? Pittsburgh always sends their center onto the ice first during a change on the fly. It doesn’t matter which player came off the ice. This is unusual for most hockey fans who grew up being told by their coaches to change for certain players. Centers change for centers. Right wingers change for right wingers. There’s a few reasons the Penguins do this. It also makes it easier to avoid too-many-men on the ice penalties. Bylsma switches his lines constantly. Pascal Dupuis goes from right wing on Crosby’s line, to left wing on Malkin’s line, to center on the fourth line. It’s easier for Crosby just to jump onto the ice first instead of trying to remember who is playing what position. The Penguins have their own matchup concern on defense. Deryk Engelland and Douglas Murray have been matched up solely against Ottawa’s slower fourth line which includes Chris Neil and Zack Smith. Engelland struggled quite a bit in Game 2 and Penguins coach Dan Bylsma might be forced to make a change. Engelland says he was put in the lineup to serve the role of enforcer, but Ottawa’s ability to make the last change at home is a concern. MacLean can attack the Engelland-Murray pair with the speedy Jean-Gabriel Pageau or Jason Spezza and take advantage of the mismatch. The Penguins strategy against Ottawa has been very defensive-minded and Bylsma will need a strong sixth defenseman on the road. Expect Mark Eaton over Simon Despres in Game 3 if they do make the change. Despite the 4-1 final score, Ottawa carried the play in the second period of Game 1. The key was their ability to breakout the puck quickly. Pittsburgh was dumping the puck softly and allowing goaltender Craig Anderson to kickstart the breakout. Ottawa spent very little time in their own end of the ice. They also stepped up aggressively at their own blueline and didn’t allow the Penguins to set up in the offensive zone. This didn’t happen nearly enough in Game 2 and Malkin was given space to create opportunities in the offensive zone. Both of these elements will be critical in determining who wins Game 3. Sidney Crosby switched to a smaller face shield this series. After conversations with his doctor, he decided that he didn’t need all of the bars on his prior shield. One area Crosby has been struggling with in the playoffs is faceoffs, perhaps because of the face shield obstructing his vision. He’s won only 46.4 percent in the playoffs, down from 54.3 percent in the regular season. Bylsma announced on Sunday afternoon that Joe Vitale (56.1 percent) will not be in the lineup for Game 3 but did not announce a replacement. If Jussi Jokinen (64.9 percent) remains a healthy scratch, the Penguins could be at a disadvantage in the faceoff circle.